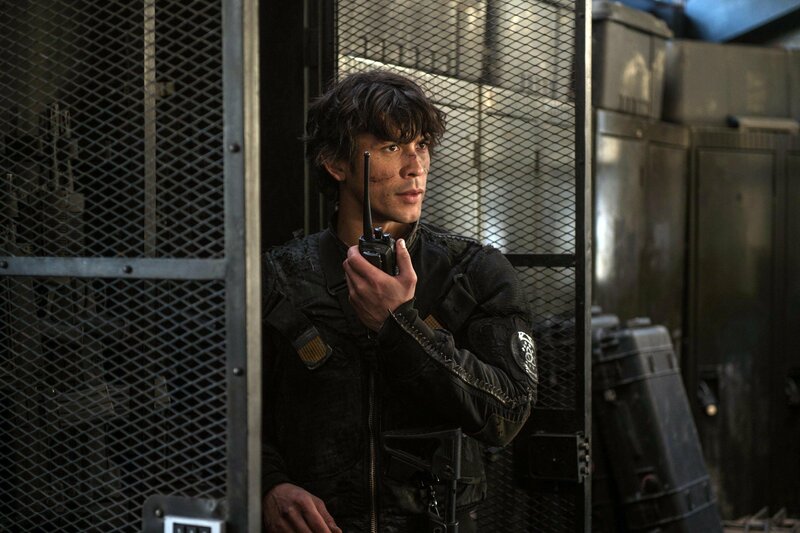 Bellamy Blake (Bob Morley) has been dubbed a significant hero in 5 seasons (and counting!) during his extensive tenure during The 100. His charisma, dedication, mass courage, and overlarge heart amplified embodiment of his character. Throughout the series, Bellamy has shown viewers and fans of what it took to be a hero, despite a few demonizing actions of his own. Yet, everyone has had their breaking point, Bellamy included. For the most part, Bellamy outweighed the negative and took heroism on a whole new level. Let’s take a peek at ten of Bellamy’s heroic encounters. Bellamy Blake is a prime example of an underdog hero as he has risked his life countless times to save those he loved. Perhaps, it was the overall theme of The 100, where saving and surviving is mountainous and complexing. Each character had their own mindset of ‘heroism’ and each act reflected a different emotional output. Both from character and fan. But this piece is strictly focused on Bellamy Blake’s heroic acts. And here are ten of them. What magnified me to this act of heroism was that Bellamy selflessly risked his life to save someone he just met. The two had an “icy” introduction as Echo was pretty straightforward upon the discovery that he was partly responsible for the insinuation of 300 Grounders in the season one finale. After the smooth over, the two neutralized and became allies. When Bellamy witnessed the horror painted on Echo’s face as the guards chose her to be a ‘bleed bag’ he stepped in and switched his life for hers. During a power/survival struggle with Lovejoy (the guard), Echo flew to Bellamy’s aid by holding down Lovejoy so that he can self-defend (and to put his Mt. Weather espionage into action), and to help get their people out. In return for helping him, Bellamy came back for her in Blood Must Have Blood Part Two. His kindness and generosity opened Echo’s heart as she probably never had anyone reached out humane gestures to her. This is an underrated scene because, after this episode, we never heard or seen Mel again. She may have been a plot device designed to emphasized Finn’s growing, alarming PTSD levels and Bellamy’s leading core. Nonetheless, while Bellamy informed Finn that they may not know the fate of their friends, or even Clarke, they should at least tried to save Mel. Sterling was determined to save his friend, but due to a horrible accident in the attempt, he himself went to his death. During Mel’s rescue, Bellamy gave his trademark encouragement and helped her to the top of the mountain, even as extending and applying first aid to her injured arm. Although Mel was never mentioned again, this was a very poignant arc to Bellamy’s character. In the early half of season one, Bellamy was considered selfish, chauvinistic, very self-confident, and cocky. As the first season progressed, transitioning in the second season, Bellamy went to the stereotyped ‘bad boy’ to being someone who is just the essential algorithm of the perfect male lead. Saving Mel had all of us swooning because who wouldn’t want Bellamy to rescue us? Another overlooked, underrated scene was when Bellamy traded his life for Jasper’s in the season one finale’s first half. Murphy-who was defined as the delinquents’ vengeful villain-was about to kill Jasper after red-handedly catching Murphy killing Miles. In a radio conversation, Bellamy convinced Murphy to let Jasper go, and he will take his place. When he had done this heroic deed, Murphy nearly lynched him in retaliation. If you can recall, Bellamy nearly hung Murphy for an uncommitted crime of murdering Wells. The dynamic of Bellamy’s switch was another prime example of positive character development, his changing views on humanity, and the fact that while at first he was burdened by Jasper’s constant agony, he grew soft, and eventually befriended him. Day Trip will always be a permanent fixture for remembering classic episodes. The very fact alone that Bellamy and Clarke ventured off together to find supplies, faced their demons head-on, had a hot teacher/student moment, and realized that not only do their people needed them, but they are in need of one another. It was the climax of realizing that not only that Bellamy was hit hard with his demons, bearing the guilt of hurting so many people. He couldn’t come to forgive himself, but Clarke honored him with the forgiveness. From that point on, the two formed an unbreakable, if trialed bond. The goal of Bellamy’s espionage assignment was to get both Skaikru and the Grounders out of Mt. Weather. Throughout the ordeal, he learned that the majority of the residents were against the inhumane practices of Cage Wallace and Dr. Loralei Tsing, and there were innocent kids. I believe that Bellamy did his job successfully, albeit that it resulted in trauma and scarring. Radiation rain poured down from the skies, causing the Arkadians to seek refuge inside the structure. Yet, two helpless souls, Mark and Peter Colton (a father and son) became trapped in the forest, with nowhere to go to escape. Bellamy, donning a suit made from what appeared to be garbage bags, stepped out into the burning rain to the rover. Unfortunately, he couldn’t reach Mark and Peter, who died out in the forest. Yet, his hope and perseverance were strong until the end, but it left him broken because he couldn’t hold on to his promise. It should also be of considerable mention that Bellamy used his heart to act on the mission and used his head when he realized that he couldn’t do it. However, this act continued to strengthen Bellamy’s character growth and psychological manifestation. I don’t know if I can accurately place this moment in the “heroic” category, due to mixed opinions, but I think it does hold some merit. When Octavia caused major tensions within Wonkru, Spacekru, and Clarke and Madi, and himself and Echo, he had to put to a stop to her tyranny. Or at least, he attempted to. Lacing her ration share with Monty’s algae, Octavia fell into a coma, her clan not knowing if she would wake again. When she did, she sentenced her brother to death. Bellamy only wanted to save his sister from herself, fearing that he would lose her if he didn’t. In an ironic twist, it turned out that he was the one who had to be saved. Madi is the last Commander of the Grounders, yet the nearly all the past Commanders, Lexa included, are still very much alive (in spirit) inside her mind. While she mainly listened to them in the beginning, it was Bellamy who ignited that they can shift and make changes. He shared that they were once the criminals, The 100, who landed on someone else’s home and engulfed in war. This would be the chance for Madi to break that cycle, to be better than the Eligius prisoners, better than them. Bellamy’s advice must have made a positive impression on young Madi because she allowed the prisoners to board the ship, explaining to Clarke that they must earn their living. If it wasn’t for Bellamy, Echo would have committed suicide for the deeds that she has done. In my opinion, having a second character suicide would not have bode well in the season 4 finale, as we have lost Jasper Jordan in The Other Side. Yet, although Bellamy doesn’t trust Echo (yet), he shares with her that he too is afraid. With her joining him up there, they have a better chance of surviving. His own charm, empathy, and in-depth speech worked as heroic aesthetics. While most would argue against this interaction, I find it very empowering because despite everything that happened between them. Bellamy still offered her kindness and encouragement, just like he did in Coup de Grace. It was this kindness that Echo clung onto and ignited her to overcome her fears. It was the key for Echo of becoming a better person and proving herself. There was a lot of undertoned foreshadowing in season 4 between the two, as there was always that magnetic hold between them. I know that this scene has been gloriously spoken about in the past, but I am inclined to bring it up again. Everything about the “She Is” scene screams volumes about Bellamy’s heroism, and how Morley conveyed the negotiation with Diyoza olf releasing Clarke with a mug and the trade of 283 for one. It was magic unfolding on our screens and we souped it up. We all knew that it would be Bellamy would be the first one to reunite with Clarke, although she was a bit shocked and surprised to see him standing there, and alive. Season 6 will land on April 30th, after a year hiatus. Up until the last week of March, there was nothing but silence, and no spoilers or tidbits to go on. That all changed when we got the first look of this punchy poster, hypnotizing trailer, and just last week, the opening credits. The content was indescribable and certainly worth the long and excruciating wait. Oh, we also got these early release photos from NYCC 2018, an exclusive from TVline. What did you think of the 10 picks chosen for Bellamy Blake’s heroic measures? With season 6 airing in three weeks, what do you see Bellamy doing? Other than be burned up by the two suns?